French bakery and casual healthy food made with organic ingredients daily supplied to us by local farms. Incredible place, a piece of France in our big Chicago, I can't wait to come back ! All the dishes were good, the decor is beautiful and the atmosphere is amazing, definitely the place that makes me happy ! Great place and amazing food! Decor perfect. Music loud, it takes from the vibe of the decor. Sadly, they're understaff. Service wasn't efficient. Cool place and the service was good. Food was just OK. For example, the crepes were boring and incomplete. Ingredients described on the menu were left off the crepes. They need to improve the food to stay in business in my opinion. Also, I trying calling over 2 or 3 days several times per day and they never answered the phone. Very strange. We were a group of 6 and while we all liked the place, none of us were eager to go back. 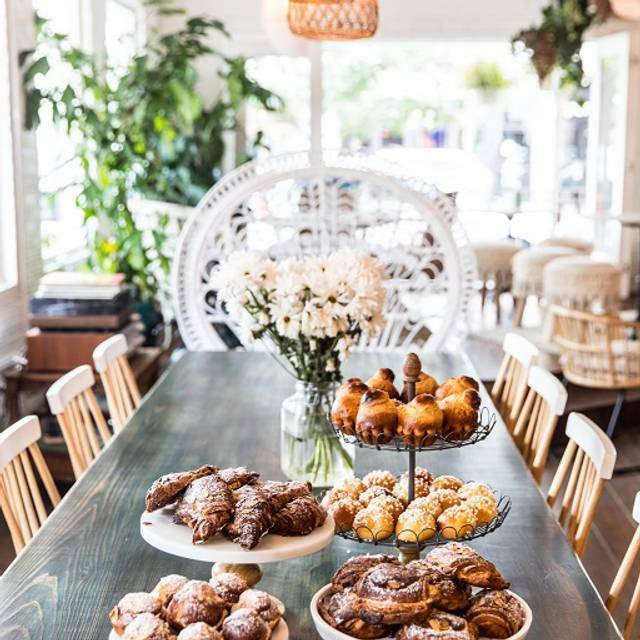 The only thing I enjoyed at Maison Marcel was the almond croissant which was HEAVENLY. Other than that, the entrees weren't great (overcooked eggs, cold omelet); the service was frustrating (had to ask for menus; remind the server to bring our pastry; were told no when we asked the host to close the front door on a 25 degree winter day). This place is all hype and seems designed for an instagram post rather than an actual dining experience. I would only go back to get that croissant and then immediately leave. Went for brunch on Sunday. Food was good, great coffee and not a bad price. Service could use a major improvement. The service was absolutely terrible! We had to ask the host to send over our server no less than eight times. 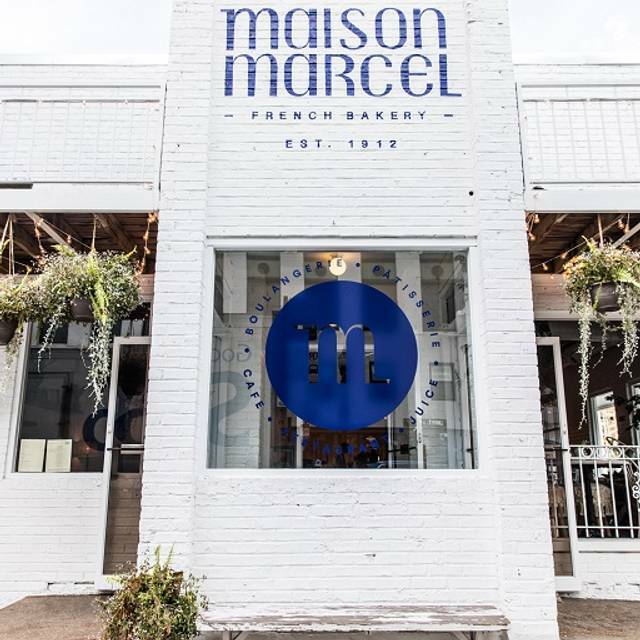 Heads up - Maison Marcel does not/is not willing to accommodate nut allergies. My friend who is gluten and dairy-free had no problems though. After waiting 15 minutes for a cup of coffee, the waiter told me I couldn't order any food items... I ended up being able to talk them into letting me get a stripped down version of something on the menu, but overall unimpressed with how the situation was handled. I have never had an issue getting nut-free menu items before, so this was a big surprise. Do not recommended, will not be back. Dreadfully slow on both ends. We ordered food there this weekend and they forgot to bring us plates and silverware. When I went to the counter to get them myself, it took 5 minutes to flag someone down. Again, I love this place. Just leaving these notes in an effort to help improve! Ambiance is great. Most of the servers are French and their croissants are authentic and delicious. I found my croissant sandwich meal to be a bit small and the service was slow, as other reviewers have stated. I’d go back but I wasn’t blown away. I love Maison Marcel. Food is delicious. Space is beautiful. Unfortunately, they were horribly understaffed and one, very kind, woman was doing her best to make everyone happy. Hopefully that won’t happen again. Food and ambiance were great - but the service was definitely lacking. There were only 2 servers for the whole place from what I could see. We also ordered coffee drinks that arrived after our food due to the same baristas serving the walk up coffee counter and the restaurant. Food was clean and delicious though, so I'd definitely return! 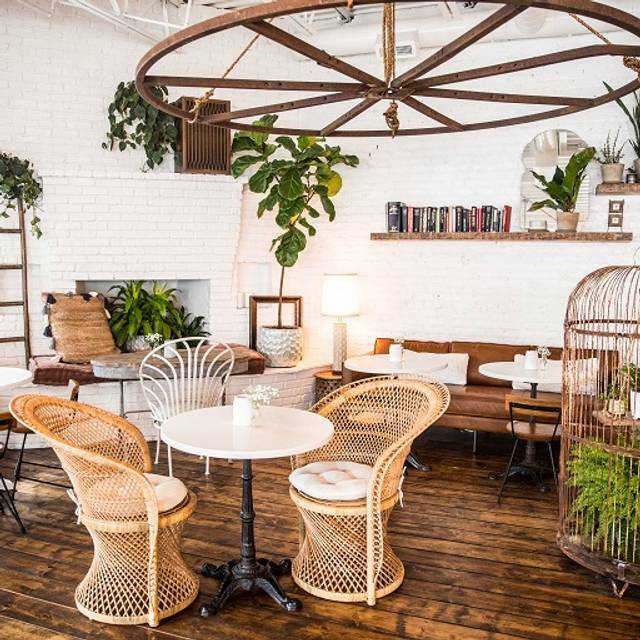 Cute little place for brunch! The food was good and the bakery items super yummy. Will come back for to go pastries. The regular coffee was extremely watered down and the food was just average, omelette was overcooked. Won't go back for food, just pastries. Could not find my OpenTable reservation but was still able to seat us. Maison Marcel is new. We have given this place two tries now. We have had a really bad service experience both times. We like the food, the croissants are good, though this time a bit under cooked. It seems the place continues to be understaffed. The servers on the floor are trying. Not sure what goes on back in the kitchen but when servers go back there they are gone for a really long time. Overall, I'd say they may need someone to really direct the floor and keep things moving and they need to add some staff to get things into a rhythm. We were surprised that after giving a rough start a full month to improve before we returned, it literally wasn't any better. Brunch was good, but they really should get an alcohol license for mimosas, wine, etc. The atmosphere and food were great. The pastries are unbelievably delicious! The service, however, is poor. Drinks and pastries did not arrive at the table and had to be reordered. Food was delivered to the table without silverware and the server never returned so I got up to get it myself. I know the atmosphere is leisurely on purpose to reflect a truly French experience, but this was a little too lackluster. Polish the service and this will be a winner! Oh- and limit the number of people walking around taking photos for Instagram. It was a little obnoxious. I really enjoyed my brunch at this place. Staff was charming and the food was right on point. I came here for brunch on a Sunday with a few friends, and we really enjoyed ourselves! 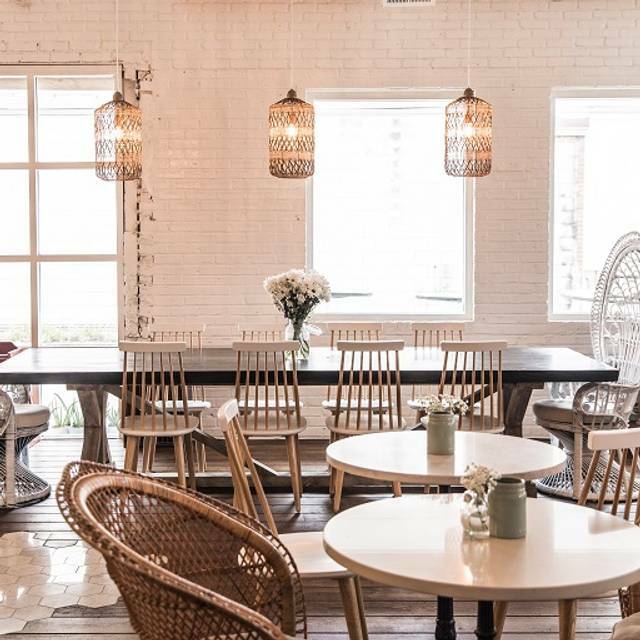 It's definitely a cute, girly type of place that was made for Instagram. The food was fresh and delicious, although perhaps a bit overpriced. 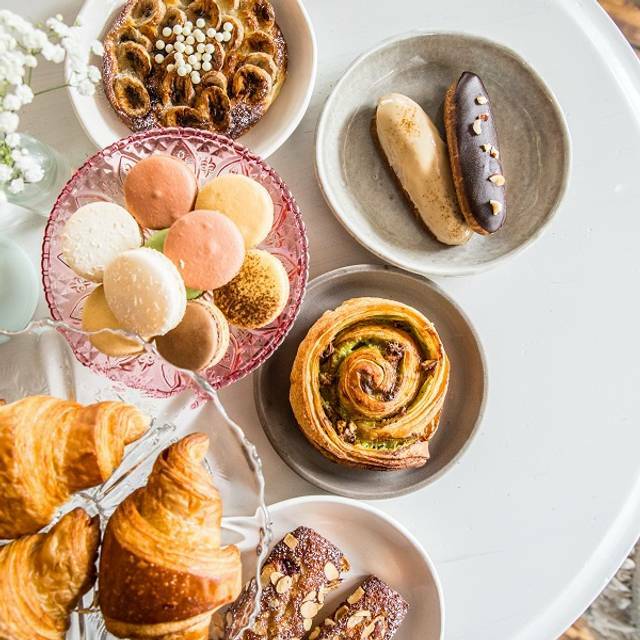 I would definitely come back for brunch, lunch, or even an afternoon cup of tea and pastry from the bakery! Super cute place and the service was great! Also a good place to hold meetings/get work done as I noticed a lot of people were doing while I was there. Small menu features tasty options in an adorable atmosphere. Service is laid back, full of personality, and very helpful. I realize this place opened in July, so maybe they are still working out the "kinks." But I was a bit disappointed. Aside from the water, we had to ask for pretty much everything - spoons for coffee, silverware and napkins for food, our actual food, salt/pepper, etc. At one point, only 2/5 of us were served and the waiter asked "Can I get you anything else?" - we said the rest of our food would be nice. I think they realized the service was less than par, so they gave us 15% off our bill. The place is really cute but I think it's probably better to come in, order at the counter and take some pastries to go. They really need to work on their service...when we left, the waiter said "please come back and visit us again when it's less crazy." I went to Maison Marcel for brunch and was excited to order the salmon with toast when the waitress then told me they ran out of bread so I could not order the tartain either. What kind of bakery runs out of bread?! 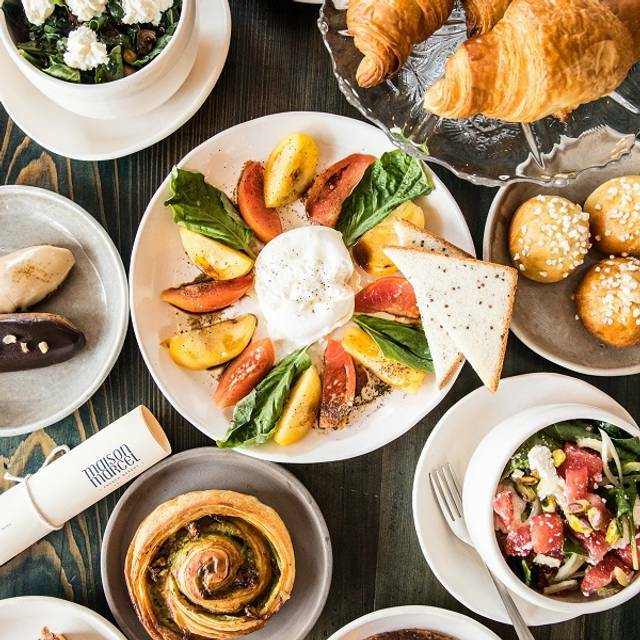 Especially at the peak hours for brunch when your brunch options include bread! Since I couldn't order the things I wanted, I asked if I could get the salmon dish with a croissant instead and she said the owner wouldn't do that. I also ordered a watermelon juice and was not asked what size I wanted. I didn't realize there were a small and large option until after I got it and she just assumed I wanted the larger size so I ended up paying $3 extra. Our waitress was flighty and not very friendly, nor do I believe she had proper training. Overall, the ambiance is gorgeous, but the service definitely needs work. Lastly, if you are advertising your restaurant as a bakery, then you should probably have bread available.